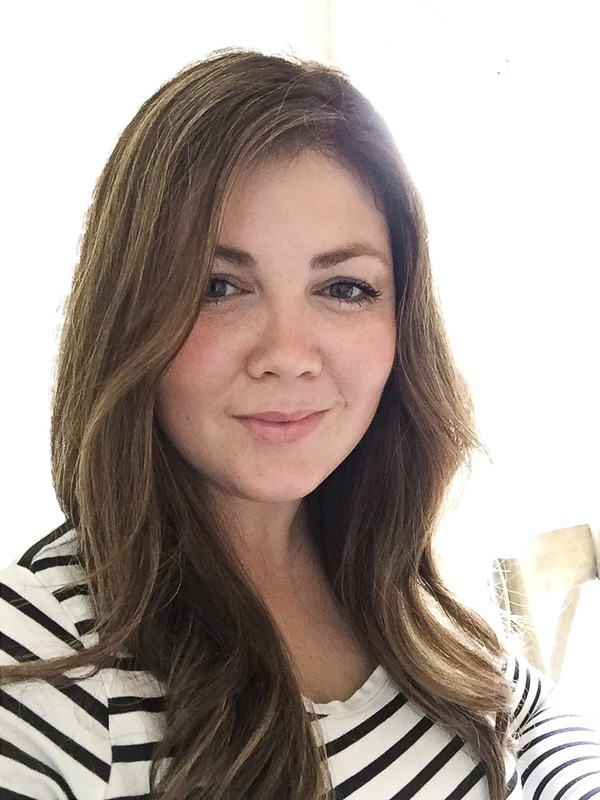 I am so excited to have Discount Tire sponsoring this post today! 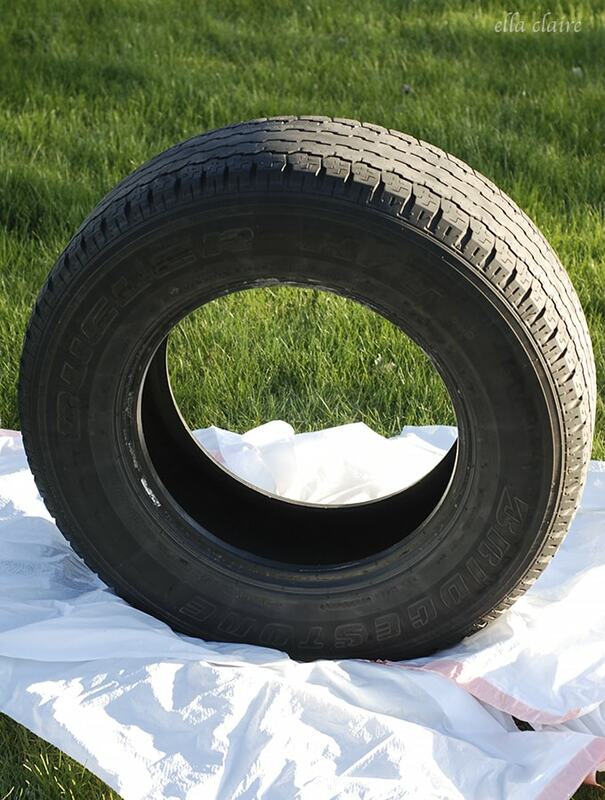 I thought it would be a really fun project to creatively repurpose a tire in honor of Earth Day tomorrow and I knew just what project I wanted to do! 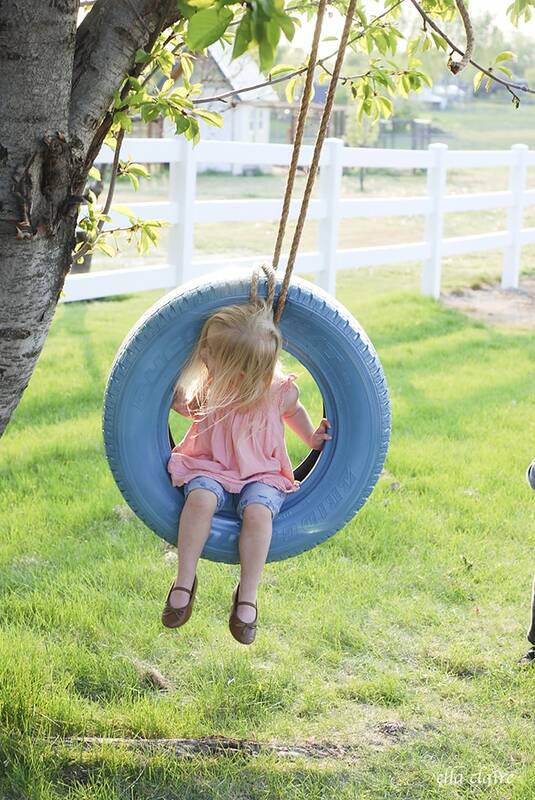 My parents live out on beautiful property and I loved the idea of building a tire swing (with a little punch of color) out there for all of the grandkids to play with. It was a fairly quick and easy project, and the results were a total hit with the little ones! 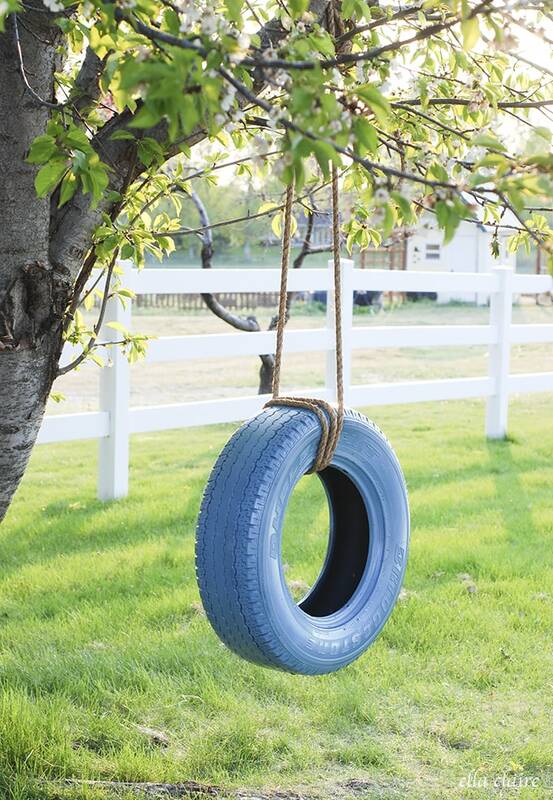 Nothing says lovely spring and summer evenings like swinging on a tire swing! It was easy and quick to grab a spent tire from my local Discount Tire. They had a bunch out in their recycle pile to choose from so I picked one that was pretty clean, medium weight and thickness, and nice and sturdy and shapely. When you purchase new tires, you are always welcome to take your old ones home with you too, so this would be a great project for those! 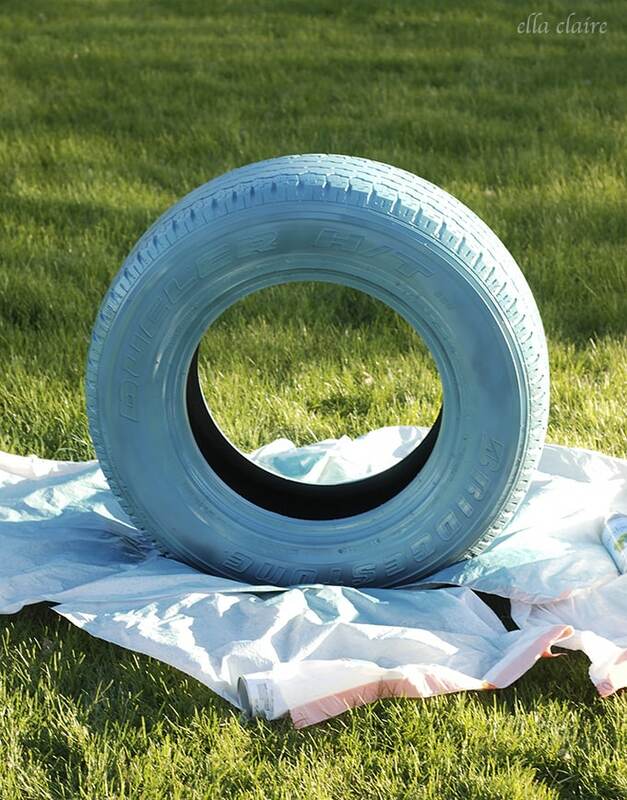 I couldn’t get the thought of a cute blue tire swing out of my head, so I decided to paint my tire! I thought this step would be harder than it was, but it turned out to be SO quick and easy… and totally worth the unique end result! I started by lightly cleaning the outside of the tire, brushing it off with a dry rag. If your tire is really dirty, you may need to bust out the soap and water or degreaser. Mine wasn’t too bad to begin with. 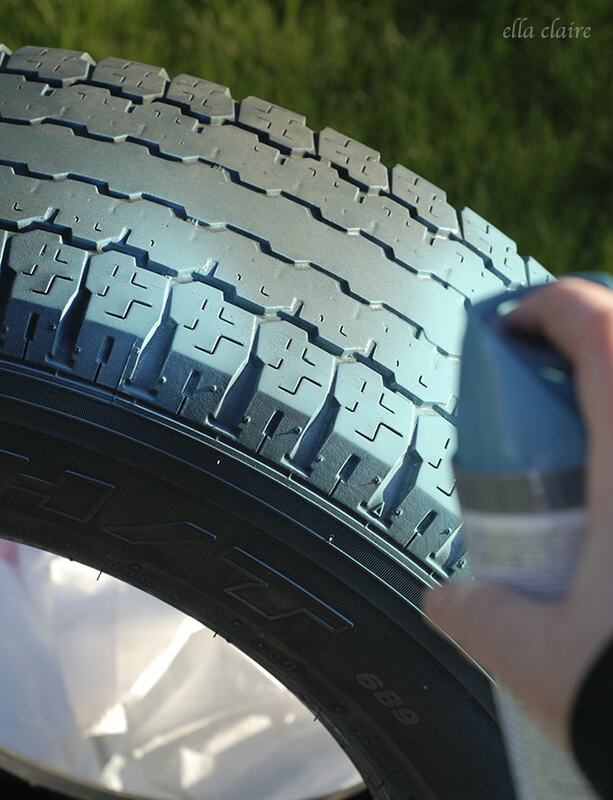 I sprayed my tire with two good coats of this lighter aqua blue outdoor spray paint that I found at Lowes. I used approximately 2 1/2 cans of spray paint total. This is just one coat, so you can see that it really needs the full two coats. When I was finished painting both coats on my tire, I let it dry overnight. My dad helped me hang it on one of their blossoming cherry trees the next day (he did most of the work:) ). You want to make sure you pick a good solid branch of a strong tree. I hung it relatively lower to the ground since all of the grand babies are still pretty young. I also hung it far enough away from the trunk that they wouldn’t smack into it when swinging. We wrapped the rope around the tire a couple of times and he used a clove hitch knot to tie it to the tree. 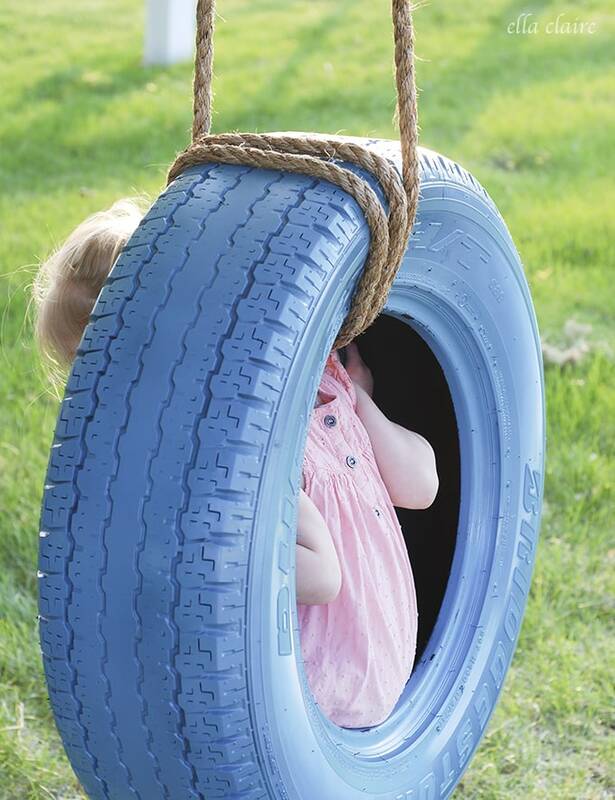 If you are going to build a tire swing, and don’t have a strong dad that is good with knots to hang it for you, I highly recommend researching which knot will be best for your project. There are many knot tying guides and tutorials online. I have a feeling this cute swing is going to get quite a bit of use this summer! Ella wanted to be pushed and pushed! She loves it already. Oh how I love the fun beginnings of easy summer evenings! You can drop by your local Discount Tire for help with any of your tire questions. 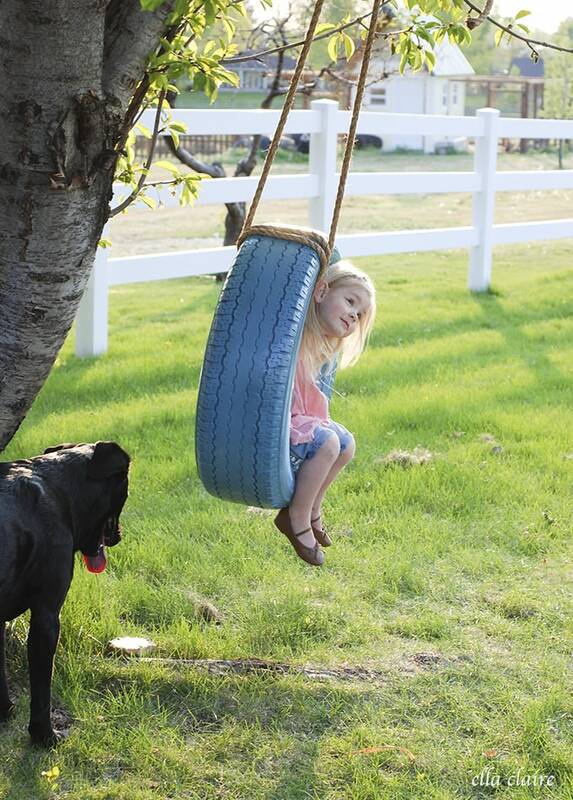 I definitely think you need one of these pretty swings so I hope you share your repurposed tire projects with me! My mom even got in this one and swung around! We love it already. Oh that is so cute!! Great idea!! Ella is so darling to!! Oh my goodness, Ella is so big now! These kids grow way too fast! Love the pretty blue! 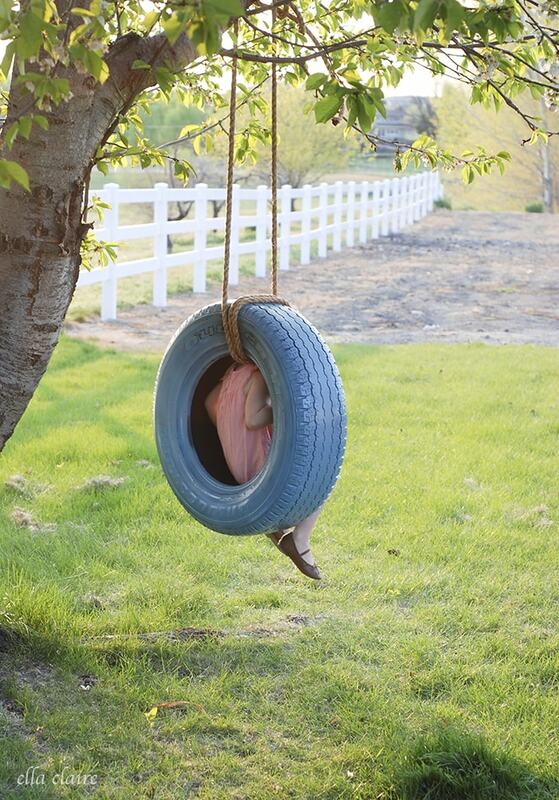 Here’s a tip you might want to try with your tire swing. We drilled a couple holes into the bottom of the tire so rain water would drain easily. One less spot for mosquitos to breed and the kids don’t get messy with stagnant water. I hope your children have many years of memories swinging at Grandpa and Grandma’s house. This is so adorable! Love that you painted it blue too. OH MY!! SO cute! I think I need one of these! 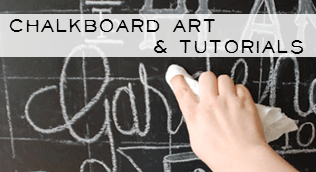 Great tutorial – thanks, Kristen! this turned out great! I would have never of thought to look at a discount tire place to make a fun swing! We need to do this for our kids asap! I love this on so many levels. 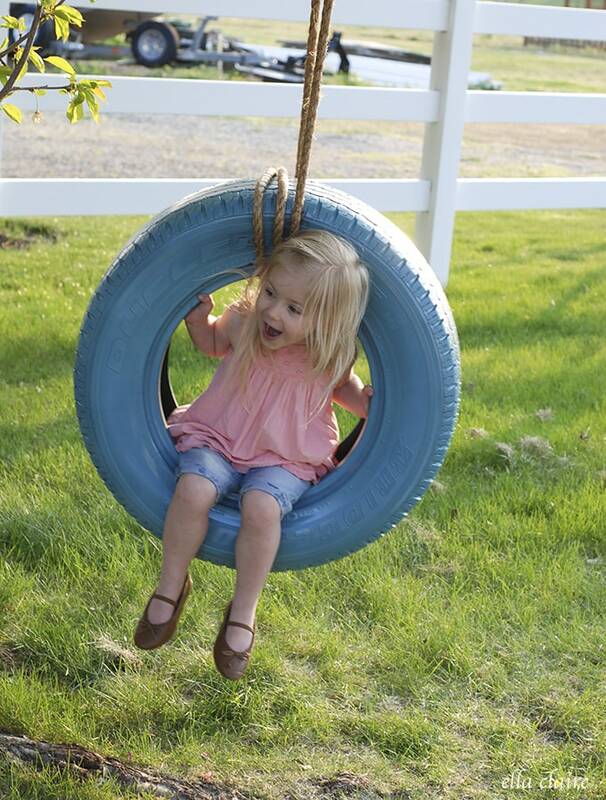 Cool idea to make a blue tire swing and I love the pictures of your darling girl! So fabulous! Love the color! I love this!!!!!!!!! makes me want a big ol’ tree!!! Who knew an old tire could be so cute?! Love this idea! What a fun project! I love the blue and your pictures are gorgeous! 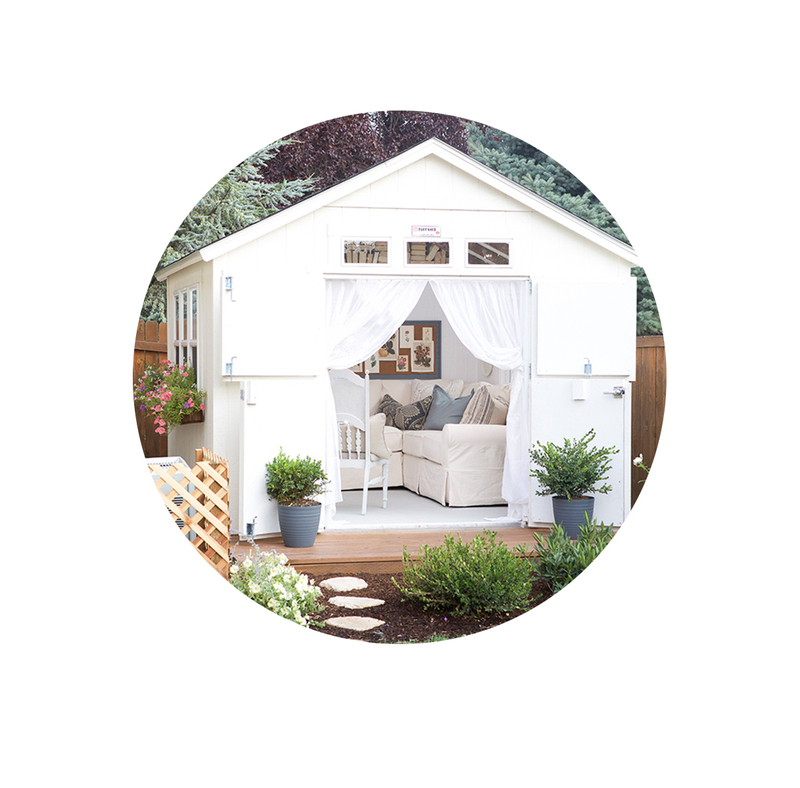 We are getting down to the home stretch with schooling and starting to think about buying our first home, and this is beautiful inspiration for our backyard (a girl can dream, right?). Love this idea! I wish we had a big enough tree to hang one from! Love this Kristen! My parents best friends had one & used to love going on it, happy times:). Now Ella can look forward to going to your parents house. Great project!! So cute! Love the color your chose and your daughter looks like she’s thoroughly enjoying herself. 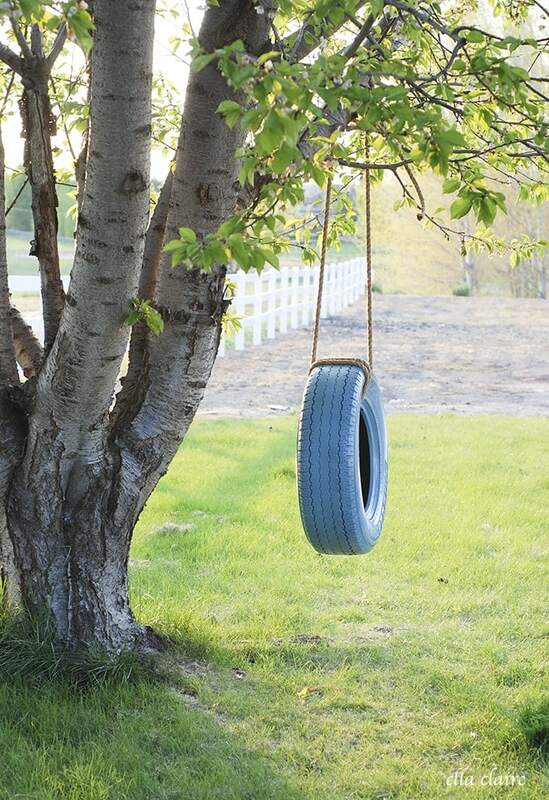 I’ve been wanting to hang a tire swing in our yard but can’t find a good branch to do it. This is so sweet. You took it to the next level with that blue paint. Adorable!! So cool! I love tire swings. This looks really easy to make. Great fun for the spring and summer! This looks so fun! Absolutely love the blue – your photos are gorgeous! Curious how the rope was tied to the tree. Was it looped around the branch and tied on itself? For whatever reason, I can’t picture it. Looking to do something similar, but for a bird/squirrel feeder. No little ones yet. Yes, that is how we did it 🙂 A feeder is a cute idea!